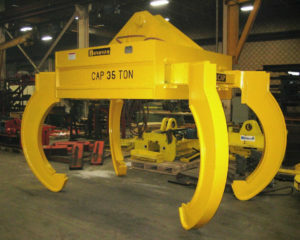 A unique, rotating axis grab solved a challenging problem faced by a manufacturer of special refractory products. 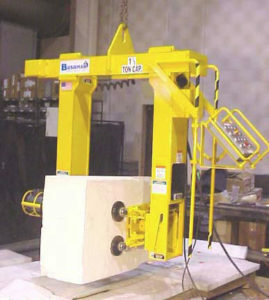 The application required a device that could safely pick up and gently rotate 2,500 lb refractory blocks that are 6 – 20 inches thick and 40 – 72 inches long. Nucor Steel was trying to reduce maintenance downtime on its electric steel furnaces. The maintenance involved removal of the bottom electrode, a 120-inch diameter circular steel plate. Through the course of furnace operation, the plate sustains a significant amount of wear during the melting process, and must be replaced every eight weeks. The plate is part of a complex assembly that enables current to flow through the scrap metal charge, causing it to melt.